And Fill Your Available Hours With Ease! That big project you've been working on for the past few weeks is coming to an end. Another client has let you know she's changing direction in her business. And suddenly you're facing a big old hole in your monthly income. This is the life of a solopreneur. Even if you've been in business for years, facing a lean month (or more) is pretty stressful. And if you're not confident in your marketing abilities, you may find yourself facing some sleepless nights just hoping for a new project to bring in some cash. Yeah, I know. It's scary to put yourself out there, but if you want to keep food on the table, you need to do it. Now, I don't know about you, but writing awkward or uncomfortable emails is never any fun. I can spend hours trying to get the words just right. Here's what I did to make my life easier. Every time I had to send one of those uncomfortable emails, I saved it. Then the next time I needed to ask for a testimonial or follow-up on a referral or propose a new project, I'd pull out my email "swipe" file, do a little editing, and hit the send key. Easy! And SO much faster than starting from scratch! Knowing what to say is the hardest part! If you've ever sat down and wondered where your next client would come from, or how you could manage a cash boost for an unexpected bill, or how to replace a client who's retiring, then these templates are for you. I'm sharing with you the very same emails I personally wrote for use in my own business, so you can have fill-in-the-blank ease when you face these same situations. These emails have brought in new projects during lean months, turned one-off projects into retainers, filled my testimonials page, and more... and they can do the same for you. I'm sharing my personal email collection with YOU! ​​Project Proposal Email Template: ​Top-earning VAs are more than just task doers. They're trusted consultants who regularly propose new projects. This template makes it ​easy. ​Available Hours Email Template: Send this to existing clients and new prospects, and add it to your autoresponder series to be sure everyone knows you're accepting new clients. ​​New Retainer Proposal Email Template: ​The best prospects you have are those who have already worked with you. This template is perfect for offering a retainer relationship to a project-only client. ​​Special Offer Email Template: ​We all run a bit short on cash sometimes. If you're in a pinch, send this email to your clients or mailing list with a special offer to bring in some business​. ​​New Services Email Template: ​Offering a new package or service? Let your prospects know with this template. You may find it's just what they're looking for! ​Request for ​Referral Email Template: ​By far the best marketing tool available to you is word of mouth. Not everyone will think to refer you to their friends and colleagues, though. This template is the answer. ​​Introduction to Services Email Template: ​Make it easy for clients and prospects to know if you're a good fit for their new project. Just add this email to your autoresponder, or send it out after an in-person ​connection. ​​Rates Lock-In Email Template: ​Raising your rates? ​Use this template to reach out to everyone you've connected with in the past few months to offer them the opportunity to get in at your lower rates. ​​Personal Meeting Follow-Up Email Template: ​Don't ​let those networking events go to waste. Send a quick follow-up email to stay connected, and let them know how you can make their life easier. ​Request for Testimonial Email Template: Testimonials are powerful marketing pieces, so why is it so hard to ask for them? This cut-and-paste template makes it easy. ​R​eferral Follow-Up Email Template: ​Don't wait for potential clients to reach out to you. Be proactive with this email template. ​​​Email "PS" Templates: ​​Use these 15 compelling post scripts ​in your autoresponders, in broadcast emails, or in your personal correspondence. ​​Social Media Post Templates: ​Grow your mailing list and offer your services with these fill-in-the-blank social updates. ​Email Autoresponder Worksheet: ​​One of the best ways to use many of these email templates is in your email autoresponder. This worksheet will help you optimize and automate your client-attracting strategies. ​​​Testimonial Usage Checklist: ​​Don't limit ​those glowing testimonials to a single page on your website. This checklist has 12 additional ideas + how to know what makes a stellar testimonial. ​​​​Gmail Canned Response Setup Checklist: ​​​Still using copy and paste? ​Unlock this useful (and little known) Gmail feature and make sending follow-ups, requests for testimonials, and other emails faster than ever. I cannot say what a tremendous help these templates have been. I am confident my communications are right on target, and I now have more time to take on more work (instead of spinning my wheels on non-income producing tasks)! Landing new clients and projects just got easier! Each template comes with suggestions for use, and several of them have multiple versions, so you can use them in personal emails or in your autoresponder. I've made them with fill-in-the-blank ease built in, but I encourage you to edit them to match your voice and personality. Take them apart and use them on your website, on social media, or anywhere else your clients are hanging out. It's totally up to you! 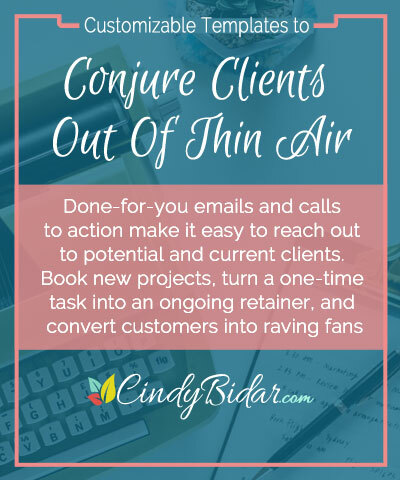 Here's the best part though: If these email and call-to-action templates save you even one hour of time or bring in even one new project, they've more than paid for themselves. PS: You are fully protected by my 100% Satisfaction-Guarantee. If these templates don't match up to everything I've said here, simply contact me at helper@cindybidar.com within 7 days, and I'll send you a full refund.